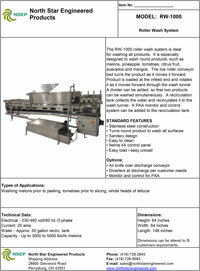 The RW-1000 roller wash system is ideal for washing all products. It is especially designed to wash round products, such as melons, pineapple, tomatoes, citrus fruit, avocados and mangos. The live roller conveyor bed turns the product as it moves it forward. Product is loaded at the infeed end and rotates it as it moves forward through the wash tunnel. 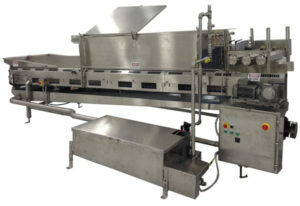 A divider can be added, so that two products can be washed simultaneously. A recirculation tank collects the water and recirculates it to the wash tunnel. A PAA monitor and control system can be added to the recirculation tank. Washing melons prior to peeling, tomatoes prior to slicing, and whole heads of lettuce.